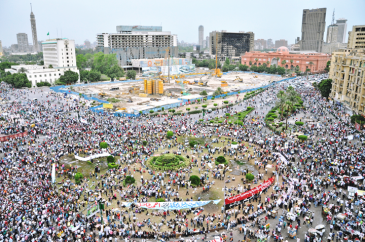 On 14 August 2013, we watched televised news in horror as Egyptian security forces brutally attacked largely peaceful sit-ins of Muslim Brotherhood supporters protesting against the removal of Egypt’s first democratically elected president, Mohamed Morsi. In just 12 hours, the state’s use of live ammunition, snipers, armoured vehicles and bulldozers led to the deaths of an estimated 1000 Egyptians and the smouldering remains of tents, banners and human debris. To onlookers at home and abroad, it looked like the tragic aftermath of a war. Human Rights Watch called it the biggest massacre in modern Egyptian history. But perhaps more shocking than state violence were the reactions of ordinary people: many Egyptians blamed the Brotherhood for bringing this tragedy on themselves. As researchers of contemporary Egypt we were faced with a baffling paradox: how had revolutionary demands for an end to state violence in 2011, transformed in just 2 years into complicity with the brutality of security forces. Why did Egyptians accept, and in some cases, cheer–as the authorities killed and maimed their fellow citizens? What role did everyday Egyptians play in demonizing the Muslim Brotherhood? In our Security Dialogue article, we deploy the concept of ‘securitization’ to understand this unprecedented state violence and its widespread acceptance in Egypt. ‘Securitization’ was developed to analyze how security threats are constructed through the speech of state elites in order to allow ‘exceptional’ measures outside of the ‘normal’ political process. But few authors have used the concept to understand security logics in non-democratic contexts, with some arguing that securitization cannot be applied in authoritarian political systems because there are no ‘rules’. We take a different view. Our article begins by examining what precisely constitutes ‘the rules’ under an authoritarian regime. We draw on the political thought of Marxist Antonio Gramsci, specifically his concepts of hegemony and civil society, to theorise authoritarianism as culturally, institutionally and socially embedded. We argue that a ‘break from the rules’ occurs when rulers deviate from the ‘authoritarian bargain’, thereby rendering state violence unacceptable in the eyes of a critical mass within society. Conversely, the legitimization of state violence is highly dependent upon a consensus within civil society. The Egypt case illustrates the crucial role of civil society in securitizing the Brotherhood through their demonization of the organization as an existential threat to Egypt. We argue that this wider discourse within Egyptian civil society set the stage for the military coup against former president Morsi on 3 July and further securitising ‘moves’ by the military. In particular, General Abdel Fatah el-Sisi’s 23 July speech, calling on Egyptians to give the military ‘a mandate to fight terrorism’, and the subsequent mobilization of Egyptians on 26 July, provided crucial political cover for the massacres to follow. Hence, the article highlights the blurred lines between state and non-state actors or, indeed, co-opted and independent actors vis-a-vis the state, in the securitization process. Finally, the article considers how this securitization process institutionalised new levels of state violence and repression, extending well beyond the Muslim Brotherhood: from youth activists to trade unionists and regime critics. We suggest that securitization not only constitutes a break from ‘normal politics’ but may also be integral to the reconstitution of a new ‘normal politics’ after the revolutionary upheavals of 2011. The article has implications for how scholars study counter-revolution and the renewal of authoritarianism in the post-Arab Spring era, pointing to the utility of securitization theory in shedding new light on the dynamics underpinning the dramatic increase in the use of state violence, complementing existing institutional and materialist analyses. More broadly, the application of securitization theory to non-democracies opens up new avenues of research into the processes by which security logics are used to enable and sustain authoritarian regimes. Research of such dynamics is perhaps more urgent now than ever before.